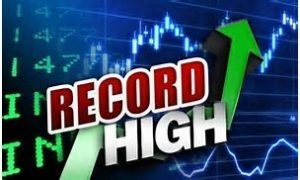 The main market of Jamaica Stock Exchange surged to the highest level ever on Wednesday with the All Jamaica Composite Index surging 7,458.32 points to a new record close of 392,602.62 and the JSE Index jumping 6,795.37 points to a record close at 357,705.39. Market activities resulted in just 29 securities trading, including 2 in the US dollar market compared to 33 securities trading on Tuesday. At the end of trading, the prices of 12 stocks rose, 12 declined and 5 closed trading, unchanged. Three stocks closed at 52 weeks’ high at the close. The main market ended with 6,162,805 units valued $201,094,929 compared to 4,785,990 units valued at $69,191,788 changing hands, on Tuesday. 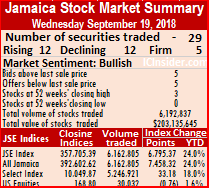 The day’s volume was led by, Sagicor Group with 4,574,803 units, 74.23 percent of the volume traded, followed by Jamaica Stock Exchange with 547,640 and 8.9 percent of main market volume and Carreras with 507,942 units and 8.24 percent of the day’s volume. Trading resulted in an average of 228,252 units valued at an average of $7,447,960, in contrast to 149,562 units valued at over $2,162,243 on Tuesday. The average volume and value for the month to date amounts to 409,365 shares valued $3,936,656, compared to 433,603 shares valued $4,116,343 traded on the immediately preceding trading day. August closed, with an average of 224,564 shares valued at $4,310,285, for each security traded. In the main market activity, Barita Investments jumped $2.80 to closed at a record $18.50, trading 8,800 shares, Berger Paints fell 50 cents to $21.50, with 2,525 stock units changing hands, Caribbean Cement lost 75 cents to finish at $47.50, trading 15,870 shares, Grace Kennedy declined by 50 cents and ended trading of 25,183 shares at $57.00, JMMB Group climbed $1 and ended at record $33, with 9,700 shares trading. 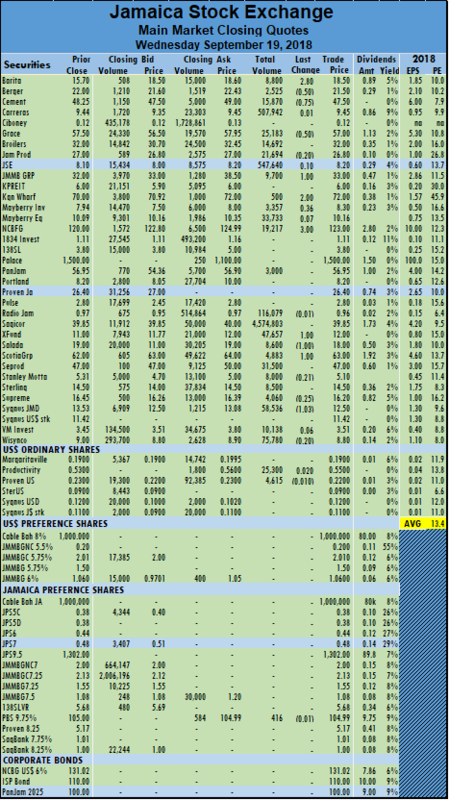 Kingston Wharves gained $2 and finished at $72 trading 500 stock units, Mayberry Investments gained 36 cents and settled at $8.30, exchanging 3,357 units, NCB Financial Group climbed $3 and ended trading 19,217 shares at $123. Sagicor Real Estate Fund rose $1 to $12 with the trading of 47,657 units, Salada Foods lost $1 to end trading 8,600 stock units at $18, Scotia Group traded 4,883 units after rising $1 to a record closing high of $63 and Sygnus Credit Investments lost $1.03 in trading 58,536 shares to end at $12.50. Trading in the US dollar market closed with 29,915 units valued at $14,950 as Productivity Business ended trading increased 0.20 cents and completed trading at 55 US cents with 25,300 shares and Proven Investments ended trading with 4,615 shares and declined 0.10 cents to 22 US cents. The JSE USD Equities Index lost 0.76 points to close at 168.80. The JSE USD Equities Index increased 0.04 points to close at 169.56. IC bid-offer Indicator| At the end of trading, the Choice bid-offer indicator reading is very strong for continuation of the market’s rally and shows 5 stocks ended with bids higher than their last selling prices and 5 closing with lower offers.